On this web page you can subscribe to, or unsubscribe from, the mailing list. Once you join, or subscribe, to the mailing list we will send you an email from the mailing list manager asking you to reconfirm that you wish to join the list. In that email there is a link and to reconfirm just click the link and your reconfirmation process will start. You will see a message confirming that "The process has been completed successfully". You will then be able to send an email to any other registered subscriber. You will also receive all emails sent to the list by any other registered subscriber. Important please read before subscribing. Only join this list if you wish to be able to send and receive emails in this way using your own regular email application. If you just want to receive Association news and not send emails we recommend you join the News Update list. This mailing list has rules. When you subscribe you are confirming that you have read the rules. Emails sent by unregistered members are automatically rejected by the mail server. 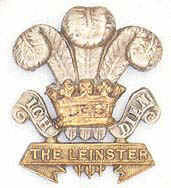 Use the form to subscribe to, or unsubscribe from, the mailing list mail.list@leinster-regiment-association.org.uk. Yes, I want to become a member of the mailing list mail.list@leinster-regiment-association.org.uk. Please remove me from mailing list mail.list@leinster-regiment-association.org.uk.